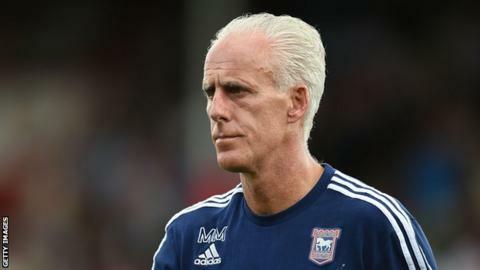 Ipswich manager Mick McCarthy hopes the League Cup match at Manchester United will give his side impetus as they push for promotion to the Premier League. McCarthy's fifth-placed Championship side face United in the third round at Old Trafford on Wednesday. "It will give me a sharp reminder of what I want to do, which is to manage in the Premier League," said McCarthy. "For the players, let's hope it incentivises them for the rest of the season." Ipswich, who lost in the Championship play-off semi-final last year, are currently three points off the automatic promotion places in the second tier. Meanwhile, Louis van Gaal's Manchester United are second in the top flight, just two points off leaders Manchester City. The Old Trafford side have not lifted a trophy since the Community Shield under David Moyes in 2013, and McCarthy believes the League Cup provides the perfect opportunity for them to end that drought. "I think Louis van Gaal and Manchester United will want to win a trophy and of course the Capital One Cup is seen as one they probably could win," McCarthy told BBC Radio Suffolk. "They're not going to want to lose against a Championship side, a nice home time against Ipswich - they'll want to win." But McCarthy said they would not travel to the north west without trying to win the game. "No matter who they play and who I play it will be a tough game," added the former Republic of Ireland manager. "But it will be for them, we're not going up there just to let them have the ball and keep coming at us, we want to attack them."